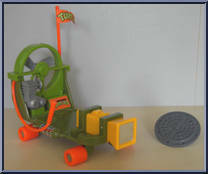 Radical, street-legal skateboard * Kick-Action Turtle Foot * Pizza_Powered Engine & Muck Blower * Sewer Cover Shield The streets won't be safe with this radical street-legal skateboard. Be the e. . . Attack 'n Grab Foot Machine! 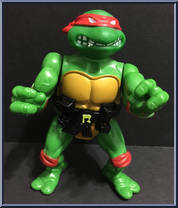 * Lower Grab-Lock Foot Claw * Automatically Grab Turtles * Retrieve Victims with Control Reel Alright, you Knucklheads, listen up! You wanna put an end to those little g. . .
Mutant Madness from the Clouds! * Big Blow-up Blimp! 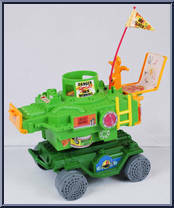 * Turtle and Bomb Launcher! 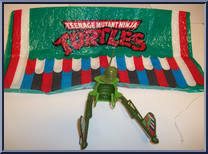 * Detachable Turtle Glider! 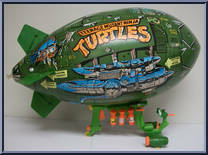 Now, with the incredibly wacky Turtle Blimp, you can help the Turtles patrol for the evil. 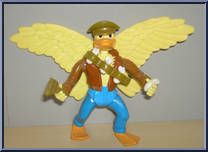 . .
Mutant Madness from the Clouds! 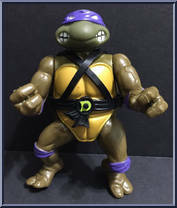 No one would expect a skybound turtle... which means you'll always have an upper hand on the evil Foot Clan with this crazy Turtle parachute toy! Scientifically design. . . 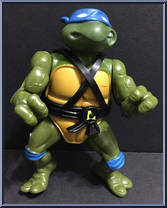 Powerhouse Punk Enforcer for the Foot Clan VITAL PUNKTISTICS: Weapons: Turtle Shell Drill, Garbage Can Shield, Knife Birthplace: Hoggywood Height: 5' 10" Weight: 265 lbs. 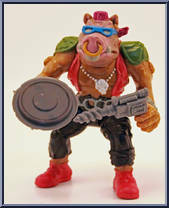 Age: 19 Bebop i. . . 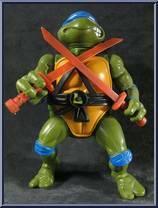 The Turtles' Creative Genius VITAL TORTISTICS: Weapons: Bo (Staff), Turtle Fist Daggers, Ninja Stars, Kama Birthplace: Joe's Pet Place, Slowklahoma Height: 4' on two legs Weight: 145 lbs. Age: . . . 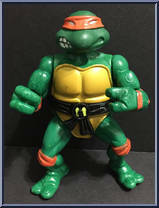 The Turtles' Creative Genius VITAL TORTISTICS: Weapons: Bo (Staff), Turtle Fist Daggers, Ninja Stars, Kama Birthplace: Joe's Pet Place, Slowklahoma Height: 4' on two legs Weight: 145 lbs. Age: 15 She. . .
Shredder's Right Hand Mummy VITAL MUMTISTICS: Weapons: Turtle Shell Biter, Electro Shock-Mace, Turtle Carver Knife Birthplace: Catacomb, Nebraska Height: 6' Weight: 175 lbs. Age: ? Foot Soldi. . . The Battle Commander for the Turtles VITAL TORTISTICS: Weapons: Katana Blades, Turtle Fist Daggers, Ninja Stars, Kama Birthplace: McMahon's Pet Emporium, Chesabeake Bay Height: 5' 1" on two . . . The Battle Commander for the Turtles VITAL TORTISTICS: Weapons: Katana Blades, Turtle Fist Daggers, Ninja Stars, Kama Birthplace: McMahon's Pet Emporium, Chesabeake Bay Height: 5' 1" on two legs. . . The Wild & Crazy Turtle VITAL TORTISTICS: Weapons: Nunchukus, Turtle Fist Daggers, Ninja Stars, Kama Birthplace: Woodys Pet Shop, Pennshellvania Height: 5' Weight: 150 lbs. Age: 15 1/2 (peo. . . The Wild & Crazy Turtle VITAL TORTISTICS: Weapons: Nunchukus, Turtle Fist Daggers, Ninja Stars, Kama Birthplace: Woodys Pet Shop, Pennshellvania Height: 5' Weight: 150 lbs. Age: 15 1/2 (people) y. . . The Witty Voice of the Turtles VITAL TORTISTICS: Weapons: Sai, Turtle Fist Daggers, Ninja Stars, Kama Birthplace: Shelly's Pet City, New Hampshell Height: 5' 1" Weight: 147 lbs. with shell . . . The Witty Voice of the Turtles VITAL TORTISTICS: Weapons: Sai, Turtle Fist Daggers, Ninja Stars, Kama Birthplace: Shelly's Pet City, New Hampshell Height: 5' 1" Weight: 147 lbs. with shell Age: . . .
Mutant G.I. 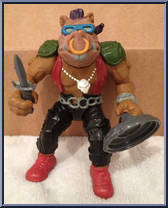 Mauler and Shredder's #1 Thug VITAL RHINTISTICS: Weapons: Retro-Mutagen Gun, Manhole Cover Shield, Turtle Carver Knife Birthplace: La Brea Tar Pits Height: 5' 7" Weight: 240 lbs. . . The Bad Guy Leader VITAL STATISTICS: Weapons: Cutting Armor, Sword, Ninja Stars, Fist Daggers, Kama Birthplace: Osaka, Japan Height: 6' Weight: 200 lbs. 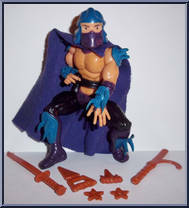 Shredder is the hideous, gruesome and a. . .
Twin Plungers of Pounding Force! * Spring-loaded Power! 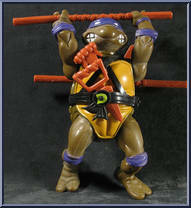 * Double Barreled Mutant Plungers! Are your streets clogged with scum like Shredder? Simply pick up the phone and call the Teenage Mutant Nin. . . High-Tech Turtle Torture Trap! * Toilet Flushin' Handle! 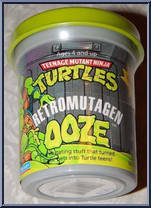 * Retromutagen Ooze Included! 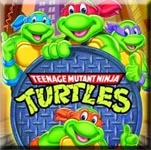 It's nail-biting time as Shredder attempts to toilet train the Turtles! Working in his secret lavatory, Shredde. . . Foot Clan's Bad-To-The-Bone Attack Vehicle Bad-to-the-bone, it's the Footcuiser - the space age '59 Caddy that shifts from overdrive to techno-glide to cruise on the ground, in the air … hey, . . .
Brain-sucking Sewer Machine * Electrifying Vilyl Leeches & Turtle Harpoon! 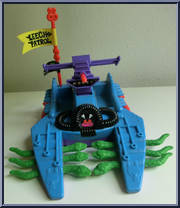 * Detachable Turtle-seeking Torpedoes! Cast off on the Footski, the Foot clan hi-tech futuristic jetski! You are on the. . .
Official Turtle Squirt Ring! Pull apart bulb and ring. Fill bulb with water, attach ring, then squirt your friends! National Turtle Quiz Jokebook's a laugh riot, too! Crazy weapons for your Turtle fi. 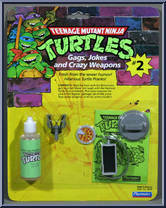 . .
Retromutagen Squirter! A few drops looks like a real mutant stain; vanishes in seconds. National Turtle Quiz Jokebook's a laugh a minute, too! 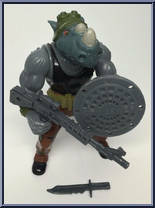 Crazy weapons for your Turtle figures: garbage can shiel. . . Calling all mutants! 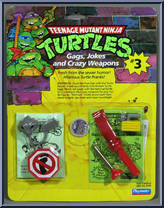 Use the Turtle Call Razzer to insult the Foot Clan! 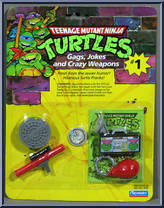 Mutant Turtle Eggs really give a Foot Clan a jolt! Just wind the ring 30 turns and insert in the envelope. National Turtle Quiz. . . 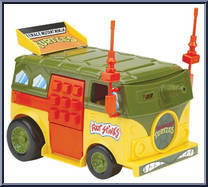 Turtle Assault Vehicle with the Works! * Flings Flying Pizzas At Foot! * Full-Tilt Shooting Angle * Holds 12 Flying Pizza Disks Hit the open sewer with the battery-operated, motorized disc-firing Pi. 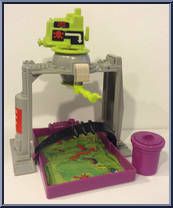 . .
Airborne Ooze Assault Weapon * Spring-powered Garbage Can Launcher * Rug-resistant Retromutagen Ooze Included! 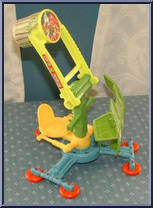 Back in the days of old when men were bold and turtles were pets, the catapult was the . . . 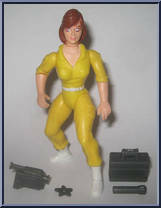 Awesome Assault Craft & Spy Ring * Official Sewer-Sanctioned Inner Tube! * Double-Barreled Muffler Machine Gun! 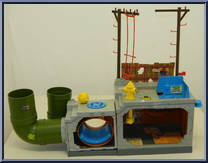 * Floating Toxic Waste Mine! Float like a Turtle, sting like a bee with the offici. . . 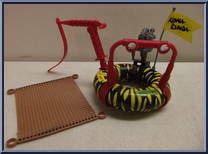 Awesome Assault Craft & Spy Ring * Official Sewer-Sanctioned Inner Tube! * Rotating Party Pump Blaster! * Detachable Foot Net! Life's a beach when Turtles take to the waste water in their Sewer . . .
Double-Decker Hangout and Hideout for Turtles! * High-Voltage Battle Swing * Real Working Elevator * Realistic Sewer Pipe Passageways Get down in the muck and scum with the Turtle's radical new Sewe. . .
Mutant Attack Van * Spring-action Foot Tenderizer Weapon! * Anti-Foot Blasters & Whacko Bombs! * Sits Six Figures Comfortably! Congratulations! You are now the proud owner of the most advanced p. . .
Mutant Sewer Cycle with Sidecar * Reversible Garbage Can Sidecar! * Real Working Sewer Slingshot! * Deluxe Garbage Can Lid Shield Screech into battle on this road-rippin' Turtlecycle. Get the Foot c. . . 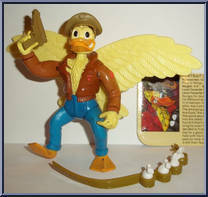 Accessories: Service .45 Pistol, Weapons Belt w/Egg Grenades, Plug in Wings, Removable Pilot's Cap Height: 4' 6" Birthplace: Peking Least Favorite Time: Duck Hunting Season Least Favorite Foo. . .